February 12, 2015 Reported in [Spirit Daily.com] from [Spirit Catholic Radio] Although the snow is beginning to melt, we wanted to share this photo sent last week by our friend Dennis Shea of Council Bluffs. The photo is of the Blessed Virgin Mary statue at Mercy Hospital in Council Bluffs, Iowa. 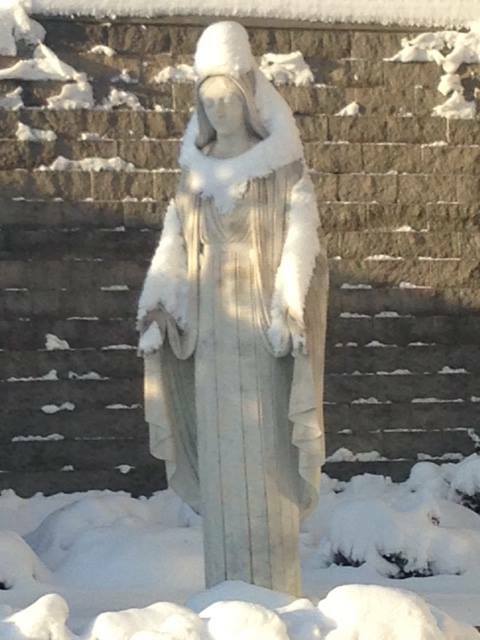 With the snow covering the statue, it almost appears that Mary is carrying a young person on her back. Interestingly, the statue rests outside the hospital's Cancer Treatment Center. God bless you all today! — with Jamie L Johnson.